Just how much does Bethel charge for tuition today, and how much is tuition forecasted to change? How do these charges contrast with other schools? Keep reading to find out. Learn how fees and tuition at Bethel University Tennessee measure up to the average and learn how to effectively get prepared for probable college tuition increases. The following table outlines how Bethel measures up to other schools nationally, regionally and by state. How Much Will Tuition & Fees Be for Bethel? Full-time undergraduates at Bethel University were charged $11,065 in fees and tuition for the 2017 - 2018 school year, prior to adjustments for financial aid. Of this amount, the expense of tuition totaled $9,805. The remaining $1,260 represents additional fees. In contrast to public colleges, Bethel does not provide a tuition discount to students who live in state. Bethel University Tennessee fees and tuition is the sum charged to students for one academic year, and does not include room and board. However, a lot of students end up spending under full tuition after receiving financial aid and other rate reductions. For more information, visit Bethel Part Time Tuition & Fees. Tuition and Fees for out-of-state Bethel students actually decreased by an average annual rate of 1.3% in the last 5 years. Tuition changed by -1.5% and fees changed by 4.4%. Based on this, we expect this year's tuition and fees to be $10,920. This means you'll spend $21,697 in two years, and $42,829 in four years. There may also be additional costs associated with higher education, including room, board, transportation, and books. 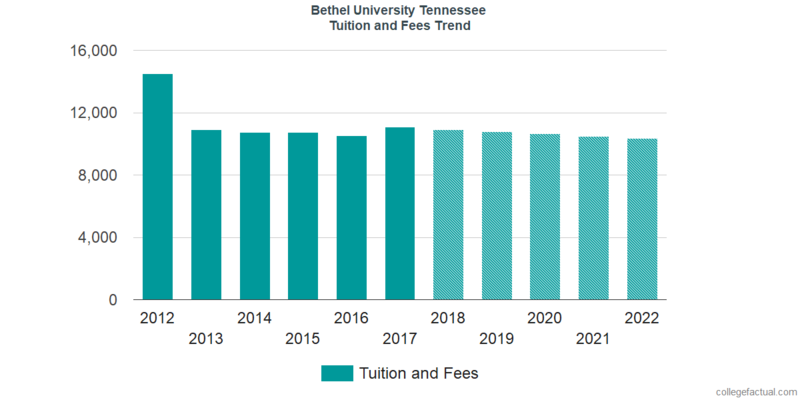 Look at the following chart to find out how Bethel fees and tuition may develop in the future. Pay attention to how much college fees and tuition is increasing annually. At most schools students will end up spending more money on their final year of college compared to what they did for their first.